All day long, Frances prayed that she would hear words she knew. She sat on the bus with her flashcards, barely noticing the trees that flew by, their new buds slowly emerging, little nubs jutting into the sky. She looked outside but didn’t look outside at all and mouthed the words on her cards. She spelled some from memory, anchor words, words like luxuriance and dulcimer and guerdon. She’d always loved words, the long ones, the ones that tripped over in her mouth. Frances tapped her fingers against the flashcards and timed her spelling. Tap, letter, tap tap, letter. Syllables were drops of rain. Frances looked at the next card and smiled. Panzanella. Her mother had surprised her with it for breakfast, put it on the table in front of her daughter and nudged her cards down, just for a second. “Panzanella,” her mother said with her eyebrows up. “Bread salad!” Frances could spell the word forwards and backwards but hadn’t known what it was. It was Italian, she knew that. All she needed was the origin of the word, not the meaning. She had speared a cube of toasted bread, drenched with dressing that was a little too sour, and popped it in her mouth, enjoying the sensation as she rolled the old word around on her tongue. Technically, panzanella is made with tomatoes but you’ll forgive us, won’t you? All we want is green. Green, green, green. We’re greedy for it. We bet you are too. 1. Preheat oven to 350ºF. Place bread cubes in a bowl. In a small bowl, combine melted butter, chives and parsley. Pour herb butter over the bread cubes and toss until well-coated. Pour bread onto a large baking sheet. Season with salt and black pepper. Bake in oven for 10-15 minutes or until bread cubes are crunchy and slightly golden brown. Remove from oven and cool to room temperature. 2. When bread is toasted, increase heat to 400°F. Place asparagus pieces on a large baking sheet and drizzle with olive oil and season with salt and pepper to taste. Roast, turning occasionally, 18-20 minutes or until asparagus is tender, but still crisp. Remove from oven and cool to room temperature. 3. 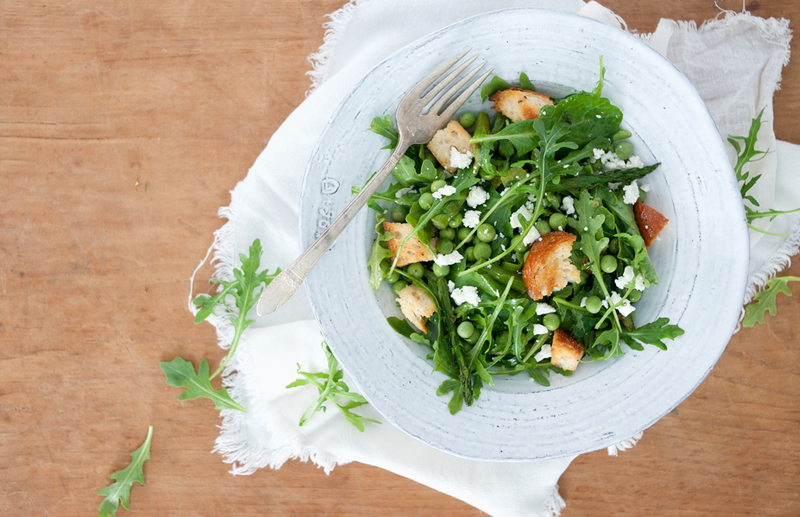 In a large bowl, combine the bread cubes, asparagus, arugula, peas and feta. 4. To make the dressing, in a small bowl, combined olive oil, lemon juice, balsamic vinegar, honey, shallot and garlic. Whisk until well combined. Season with salt and black pepper, to taste. 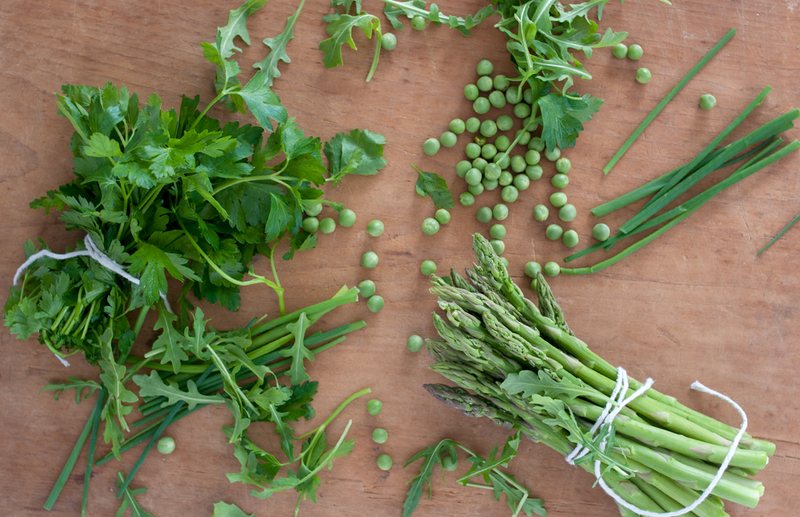 Such a lovely Spring salad! This sounds awesome! 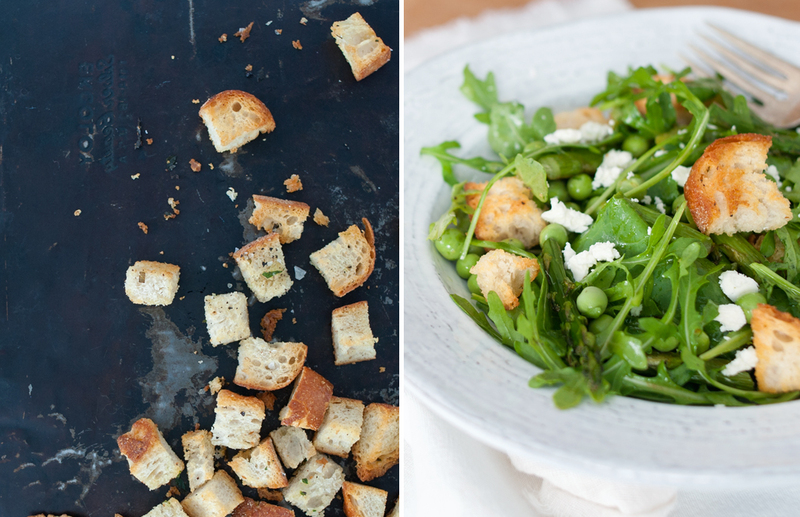 Not only is this recipe feature fantastic, but the images of the salad are so breathtaking! So lush and colorful. Beautiful.